The Szeklers origin is disputed. The chronicle of a Byzantian emperor,  "Purple-born Constantine" , suggests them as a people apart from the Hungarians, eventually descendants of the Khazars. As the son of Attila held court in the town of Székelyudvárhely ("Szeklers courtplace") some people have raised the theory that they are descendants of the Huns. The Romanian historiography maintains that they are Hungarized Romanians or Turkic people. 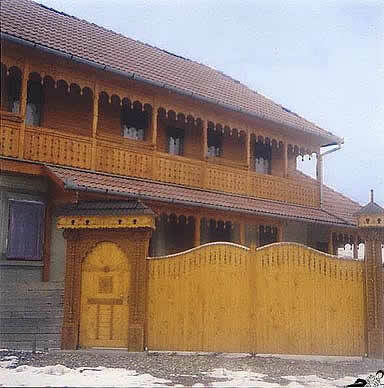 The Szeklers are renowned in both Romania and Hungary for their skills in working the wood. 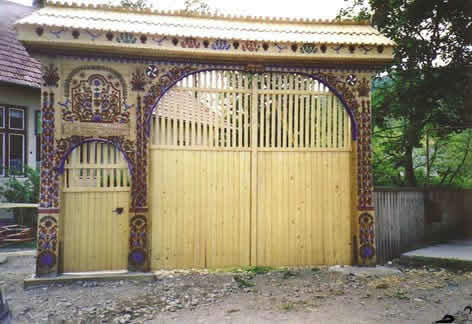 One of the specialities of the Szeklers architecture are the gates of the courtyards, the "Szeklers Gates". The Szeklers themselves are convinced that they are Hungarians who have preserved their national identity more purely than the Hungarians living in nowadays Hungary. Even before the Szeklers Land came to form part of Romania the Hungarians from outside their territory were referred to as "the Hungarians" with a certain disdain and distrust. In the Transylvanian Diet they had an own representation, apart from the one of the Hungarians. The Szeklers have preserved a "notched script" from the times they arrived in the Carpathians. (It may be called Runic for its resemblace to the Nordic Runes, but all sources I found agree that there is no relation between the two.) Allegedly in Hungary proper a similiar script existed but when the first Hungarian king, Stephen, introduced the Latin script the former was forbidden and only was preserved in the Szeklers lands. So we know that the Szeklers came to the place they chose as their home as literate people. For the (other?) Hungarians this is less certain. I have modified the order of the letters, adjusting it to our habits. The "notch script" originally was read from the right to the left. The Szeklers were given special privileges by the early Hungarian leaders and kings to perform the task given to them: to defend the Hungarian territory against other invaders from the East. These "privileges" were perhaps merely the codification of their own laws and customs that the Hungarian leaders could not or didnt want to dispute at the early stage of settlement. Besides these rights they had also the obligation to send soldiers whenever the Hungarian king of the Voivode of Transylvania would demand it. A characteristic feature of the Szeklers social organization is the prevalence of public property. 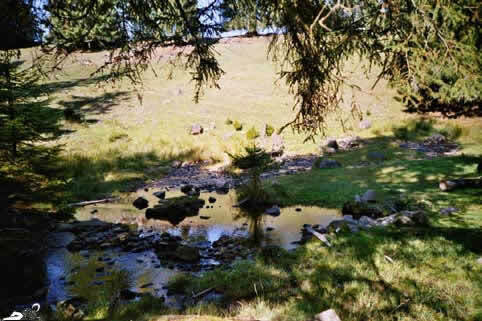 The woods and pastures were held in common, the shepherds took care of the whole villages cattle, sheep, and so on. Many of these features still persist today. Also, among the the Szeklers the women had similiar rights in holding property as the men, and the sexes were treated equally in questions of inheritance  perhaps something they preserved from the times of their migrations from the eastern steppes. In order to stress the difficult relations to their Hungarian "brothers and sisters" once again: In Hungary a lot of evidence with respect to their origins, their original customs, faith, skills, knowledge and achievements was destroyed after the ascent of Saint István (Stephen) to the throne. It is more than probable that the Szeklers, with their fierce resistance to this modernization, preserved evidence that has been lost in Hungary itself. 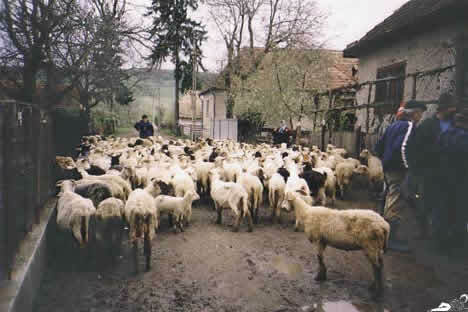 On Saint Georges day the village shepherds come to every peasant and collect the sheep in order to take them to the "estena", the summer pasture. When István, the first Hungarian leader who had himself crowned king, introduced Christianity and serfdom to his compatriots with considerable violence, he met with the fiercest resistance among the Szeklers. In a rather remote area between Tusnád and Kézdivásárhely (Tîrgu Secuiesc) lie the ruins of a castle called the "castle of the idolaters" which was the last stronghold of the enemies of Istváns reform package. On top of this hill are the rather meagre ruins that remain from Bálványosvár, the "Idolaters castle"
The history of the Szeklers from then on is a history of resistance against serfdom. The Hungarian rulers and lords of the land tried to impose it with all means, the Szeklers resisted and staged rebellion after rebellion. The leader of the greatest peasant rebellion of Hungary in 1514 was a Szekler: György Dózsa, from Dálnok (Dalnic)  in nowadays Kovasna county, or more traditionally: Háromszék, the "Three Chairs". He was an officer from the Turkish wars, and when there was a call for another cruisade against the "infidels" a lot of peasants gathered together near Pest. Talking to each other came to the conclusion that their worst enemy wasnt the Turks threat, but their own lords. They chose György Dozsa as their leader and the peasant revolt they staged became the most fierce and threatening in Hungarian history. It was crushed, and Dózsa himself was executed in an extraordinary cruel manner. 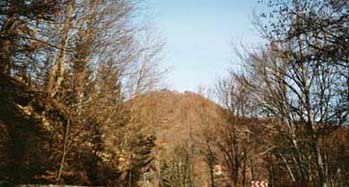 The Bucin saddle in the Hargita mountains. 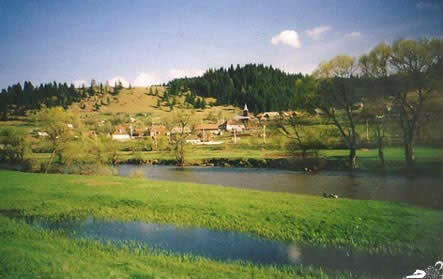 The rather remote village of Varság (Vărşag) that developed out of the former summer pastures of Székelyudvárhely (Odorheiu Secuiesc). Note the yellow, sand-like hills at the right of the above picture: They are heaps of wood shavings, produced in great quantities by the carpenters and cabinet makers of Varság, difficult to get rid of. Fog like this is quite frequent in the basins of Csík and Gyergyó, due to the waters of the rivers Maros and Olt crossing them. The Szeklers were renown fighters and so the Hungarian, Transylvanian and Habsburg rulers always followed a similiar policy: Whenever they needed an army they promised to the Szeklers to grant them their old privileges again and to free them from serfdom. Once the Szeklers had fought for them and the war had been won, they were denied their rights. So they revolted, and their revolt was crushed. So did it happen in the "Bloody Carnival" of 1596, and these revolts and repressions went on through the whole 17th century, and did not cease after Transylvania was incorporated into the Austrian Empire with the treaty of Szatmár in 1711. In the first decades of the 18th century the Austrian authorities decided to make this area a part of the Frontier Territory which meant that it was placed under the direct rule of Vienna and the military authority, the Courts War Council. When they started to draft the Szeklers forcibly into the newly established frontier regiments and those protested and refused, in 1764 Austrian troops entered by night into the village of Madéfalva (Siculeni) and killed about 200 of its inhabitants. This was the last big slaughter of Szeklers, and is remembered as the Terror of Madéfalva, or in latin: Siculicidium. Today there is a monument in the village remembering these mass killings. As many people keep cattle, sheep or goats, the production and storage of hay claims an important place in the agricultural sector. 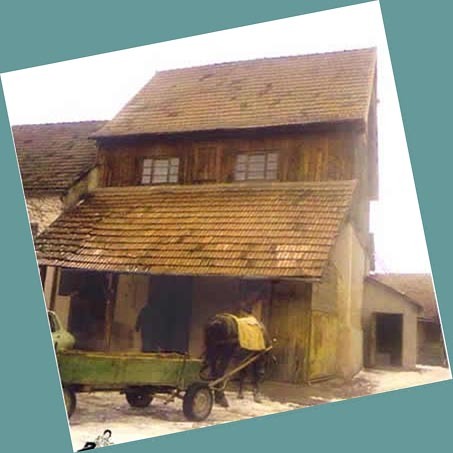 The hay is often stored in the place where it has been cut, in small wooden cabins, as the farmhouse itself doesnt have enough space to store it there. 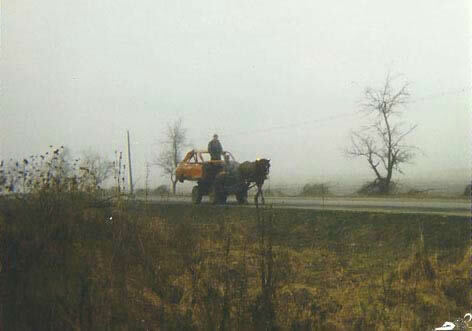 Also quite common in the Szeklers Land is the employment of horses in transport and agriculture. The persecution they were exposed to, and their unwillingness to resign to their fate in the course of time prompted many Szeklers to flee across the ridge of the Carpathians, the border of Hungary, into Moldavia and settle there. They mixed with the Hungarian speaking minority in Moldavia, the Csángós, who nowadays have been rediscovered by Hungarian politicians both in Hungary and in Romania, and are subject of controversy regarding their numbers, their national identity, their command of the Hungarian language, and most of all: their Catholic faith, often the only thing that still distinguishes them from their Romanian neighbours. The Catholic church plays a prominent role in this controversy, trying to fortify its position as a political force, and gaining territory in the field of education. These interferences do not really make the Romanian government happy, and cause a lot of tension also between ordinary citizens of Romanian ethnicity, with respect to their Hungarian compatriots. Traffic is an extremely interesting thing in the Szeklers Land. It is both amazing to watch what is being transported, and how it is done. This man brings the wreck of a Dacia to a workshop where another wreck is awaiting it. They were then both cut apart in the middle and welded together and so an entire Dacia was made out of the two wrecked ones. The wreck, by the way, came by train from another town, where the workshop had ordered it. 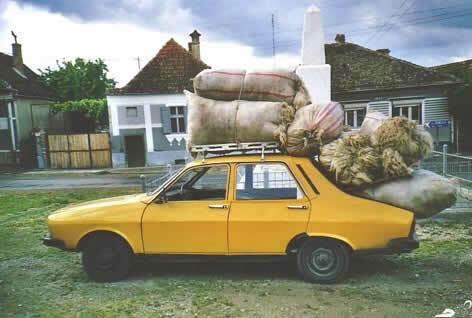 This Dacia car is taking a lot of wool somewhere. During the communist times the Szeklers for a while enjoyed a certain autonomy, but later they were deprived of it. Collectivization became very important for the central authorities in this area, as a tool to further centralization. 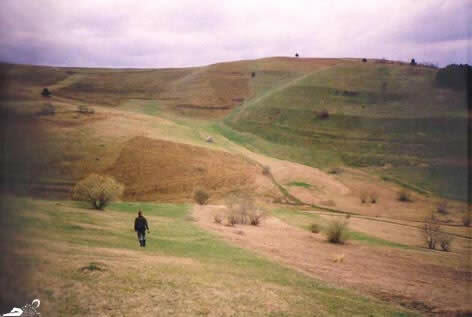 It wasnt only the private land that was especially targetted, but also in a very prominent place the common grounds of the Szeklers: the pastures and woods. By collectivizing the pastures they could be taken out of the hands of the local authorities, and as a part of the collective farms were placed under the command of a central authority. The woods were nationalized. So two kinds of public property clashed, to the detriment of the traditional one. When someone wanted to keep animals, he had to cut the grass for them in his spare time, on grounds that were formerly his own or belonged to the village, and to deliver half or two thirds of it to the Kolkhose. Only the part that was left to him he could feed to his cow(s) or sheep. And still, as a friend told me, then all the grass in the village and on the slopes was cut, not a single meadow was left fallow  on the contrary to now. 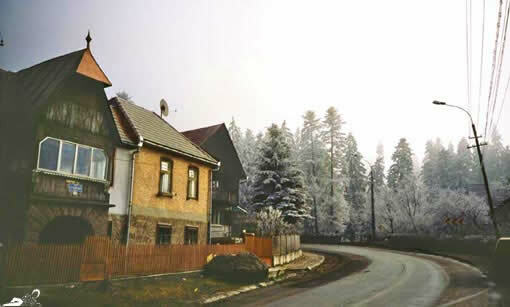 Villages with Romanian population, by the way, were sometimes spared from collectivization, although their lands would have offered better conditions for large-scale cultivation than remote (Hungarian-populated) mountain villages. This has to be mentioned in order to show that collectivization in Romania often had more political than economical aims. 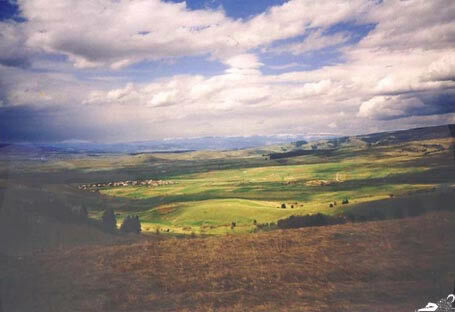 Meadows and fields near the town of Ditró (Ditrău) in the basin of Gyergyó. All the work here is still done by hand, eventually with the help of horses, or, more seldom, oxen. Only in the last years tractors have appeared. 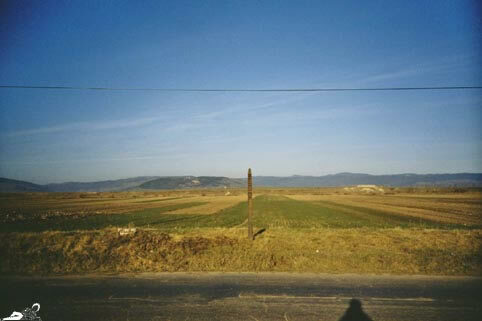 Fields and a typical carved wooden stele in Háromszék, near the town of Kézdivásárhely (Tîrgu Secuiesc). 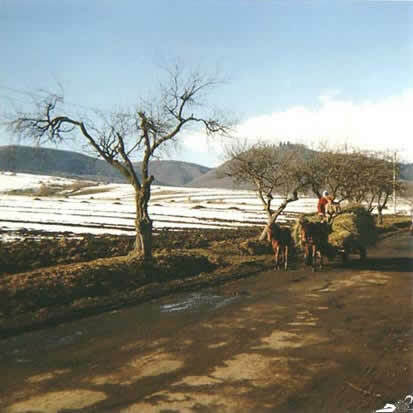 The softness of the landscape is confusing, it is in contrast to the harsh climate and living conditions that prevail in the Szeklers Land. After 1989 these collectivized lands were restituted in a complicated process that created a lot of work and good income for lawyers and judges. In the meantime the lands which had no owner became a prey for clever and unscrupulous businessmen who exploited them with almost 100% profit, with no investments. This affected most of all the nationalized woods. The woods of the Szeklers Land have been exploited to the utmost for about ten years. 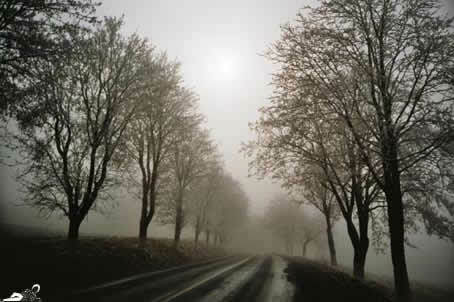 Many woods only survived because they were situated in areas that were extremely difficult to access. The special lorries that carry the tree trunks, called "remorcas" (= tow-cars) destroyed the roads. 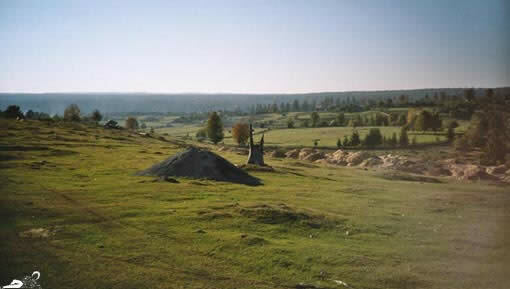 Only in the last years, after restoring the common property, the wild destruction of the woods has stopped and a process of reforestation has started. A mill in a village near Székelykeresztúr (Cristuru Secuiesc). The machines that grind the grain were manufactured in the time of the Austro-Hungarian Monarchy, that is before World War I, in the Budapest-based Ganz factory that has vanished only in the 90-ies, due to the privatization process. The farmers bring the grain and pay with a part of their harvest, getting back the remainder as flour. No cash is involved. This uncontrolled exploitation of the woods didnt take place only in the Szeklers Land, but in all of Romania, and has been the main cause of the floods that have affected Romania, Ukraine, Hungary and Serbia during the last ten years. The Szeklers Land is not only the origin of some of the tributaries of the Tisza and Danube, but also full of natural springs and mineral water, and a lot of spas. 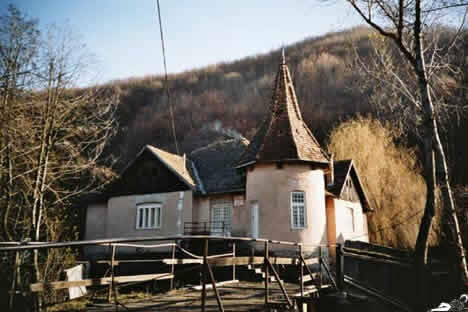 As most other touristic facilities all over Romania, they fell into decay after the communist era recreation facilities were deserted, as the organisations owning them  trade unions, schools, pensioners organizations  dissolved, or were left without funds. Slowly now private tourism on small scale is emerging and perhaps such spas as Tusnád, Homorod, Borszék (Borsec) or Hévíz (Topliţa) will one day again live up to their former glory and prosperity. Tusnádfürdő (Băile Tuşnad) in rather inhospitable weather. The heavy fog left the trees clad in a coat of hoarfrost. After 1989 lots of factories were closed, and many people were left without jobs. Some of them managed to retire at an early age. Many people I know go to work in Hungary, mostly illegally, in construction. Many of the youngers dont want to bother with working abroad (as they have no skills for that) or with agriculture (for which they have neither energy nor sympathy), they would like to make quick money with all means. The latest fashion for good-for-nothings is to join the French Foreign Legion. 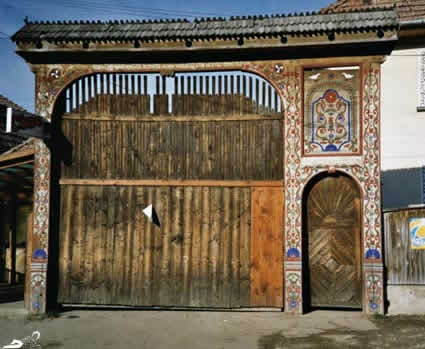 A private house in the village of Parajd (Praid) at the foot of the Hargita mountains. 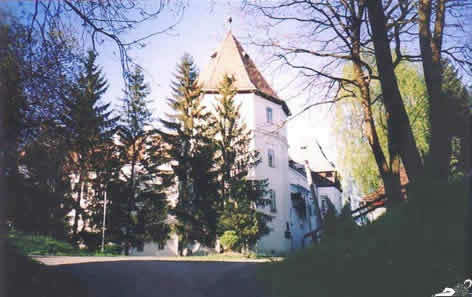 The castle of Marosvécs (Brîncoveneşti) in the valley of the Maros, now an insane asylum. The Szeklers Land has always been a country of emigration. People emigrated to Budapest, to Germany, to the United States, to Canada. Some made a good living there, others failed.